Coaching the U6 - U8 age group can be difficult. Kids at these ages and younger have very short attention spans. If you don't keep the occupied with fun drills and games, they'll start mucking around during training and your team will make very little progress. 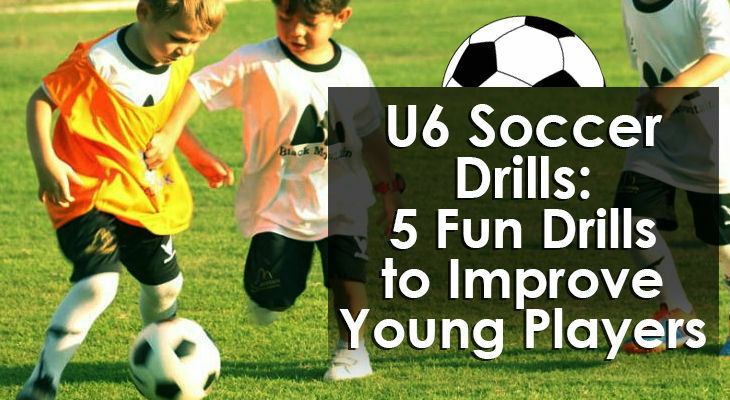 That's why I've put together five fun U6 soccer drills for you to use. These drills will keep everyone involved, help your players develop all aspects of their game, and are a lot of fun (which is the most important part). Players play 1v1 to their opponent’s end zone. Develops 1v1 dribbling and defending abilities. Players will improve their ability to get past defenders more consistently. Set up a 25x20-yard field for every 10 players. Set up four-yard end zones on each field end line. Divide the players into two teams per field. Divide the soccer balls between the two teams on each field. One player from each team steps into their end zone with one player starting with the ball. The extra players on each team rest behind the end zone in some organised manner. Play three, five-minute games. Rest and reset the soccer balls between each game. Make coaching points during breaks. Players play 1v1 attempting to dribble into their opponent’s end line for a point. When a player dribbles, under control, into their opponent’s end zone, they leave the ball and the next player from their opponent’s team starts dribbling the same ball out of the end zone. The player who was scored on, rotates to the back of their team line. If the ball goes out-of-bounds at any point, the two players inside the grid go to the back of their team lines, and a new ball is started from two new players. Play three, five-minute games. Keep track of scores to see who wins each game! Rest and rotate players between games as needed. Tournament – If there are more than two teams, make it a tournament. Team with the best record at the end wins! Encourage the players to moves and changes of direction to unsettle the defender and get past them. Educate the players to use changes of speed to dribble past the defenders when there is an opportunity. Remind the players to bend their knees and move their feet when defending to set up their tackle. Players should not dive in! Two teams of four players compete against each other to mini-goals. One of the best U6 soccer drills to develop the entire player. Players work on attacking, defending and transiting. Playing 4v4 allows players to get many actions per game. Set up a field 20x30-yards. Set up one field for every eight players if space allows. One mini-goal should be placed on each end line. Use cone gates if mini-goals are not available. Divide the players into teams of four players. If there is an odd number, one team will play with three or five players. Have the teams in a 1-2-1 formation. All of the soccer balls should be placed near the mini-goals. Play four, five-minute games. Adjust the duration of the activity to fit training needs. Rest and make coaching points between games. Two teams compete against each other and attempt to score goals in their opponent’s goal. Play kick-ins if the ball goes out-of-bounds on the sidelines. Play goal kicks and corners if the ball goes over the end lines. The team with the most goals at the end of the five-minute game wins the round. Rest between rounds and reset the soccer balls. Four rounds are suggested. Switch teams and players as needed between rounds. Make coaching points during the breaks. Touch-limit – Give players three, two or one-touch to increase the difficulty. Encourage the players to compete at game-speed. Players will get many actions in this game and allow them to experiment as they develop. Teach the players to constantly move off of each other and provide good passing angles. Challenge the players to take defenders in 2v1 and 1v1 situations. Remind the players to constantly communicate and work together on both sides of the ball! Develop dribbling, ball control, and awareness in an enjoyable activity. Players compete against one another while also improving their ability to protect their ball from defenders. Use this drill as a warmup activity for older players, or as a fun way to get young players moving and excited about the game. Play as many rounds as needed! Enter back in the game – Instead of dribbling around the outside of the playing area, players complete 10 toe touches and then are allowed back in the game. Have players do some soccer action or something fun to get back in to the game! Challenge the players to use their bodies to protect their ball! Players should use moves and cuts to avoid other players attempting to knock them out. Players are divided into two teams with one player from each team competing at a time. Each team has their own goal and cone that the players must dribble around before shooting. The first player to score wins a point for their team. The team with the most points at the end of the round wins. An under 6 soccer drill to develop dribbling and shooting at speed. Place two full-size goals on one end line of the field. The goals should be 10-15 yards apart from each other. Place one goalkeeper in each goal. If there are extra goalkeepers available, have them rotate every three repetitions. If there are no goalkeepers available, replace the full-size goals with mini-goals. Place one cone, 18 yards away from each goal. Adjust the distance from the goal to the cone depending on the age and skill level of the players. Place one cone along the end line, eight yards outside of each goal. There should be no cones along the end line between the two goals. See diagram for more information. Divide the players into two teams and assign each team to form a line behind a cone along the end line. Each player should have a ball. If there are not enough soccer balls for each player, make sure the players at the front of the line have soccer balls. Play at least three rounds. First team to eight goals, or the team with the most goals at the end of the five-minute round. Adjust the time and number of goals to fit the team’s needs. Make it fun for the players! On the coach’s signal, the first player in each line starts dribbling as fast as possible towards their cone in front of their goal. The players dribble around their cones and then shoot on goal, attempting to score before their opponent. Players are free to shoot as soon, or as late, as they want after dribbling around their cone. Players can shoot from distance or dribble closer to the goal for an easier finish. The player who scores first is awarded two points for their team. If a player scores, but does not score before their opponent, then they are awarded one point for their team. No points are awarded to teams if players do not score. After the first two players complete their turn, they retrieve their soccer balls and go to the back of their team lines. The next players in each line prepare to repeat the process on the coach’s signal. Play three, five-minute rounds or first team to eight goals. Adjust the time and number of goals to fit the team’s needs. Add more rounds if desired. Add cones – Add more cones, or obstacles, that players must dribble around before shooting. This will increase their ball control and make the game more difficult. Vary the distance – Increase, or decrease, the distance the players must dribble before turning around and shooting. Individual point system – Players keep track of their own points. Players rotate opponents and compete against each other to see who will score the most points. The first player to eight goals, or the player with the most goals at the end of the six-minute round wins! Challenge the players to dribble and shoot at game speed! Players should push themselves to get around the cone quickly and score as soon as possible. If players are new to shooting, or struggling to consistently finish, remind the players of the shooting techniques. Players should lock their ankle and have a strong plant foot next to the ball before swinging smoothly through the ball. Teach the players to take a quick look at the goal before striking the ball to see where the goalkeeper is and where the ball should be finished to score a goal. Players should focus on finding the right balance between accuracy and power. Accuracy should be emphasised over power. Two teams attempt to move the target ball across their opponent’s end line ball by passing their ball into it! Develop players’ passing accuracy through a fun and competitive game! One of the best soccer drills for 6-year-olds or use it as a fun warmup game for older players! Set up two 15-yard cone lines, 15 yards apart from each other. Place a unique coloured soccer ball in between the two cone lines as the target ball. Divide the group into two teams and have them take their positions behind opposite cone lines. Each player needs to have a soccer ball. Play three games! Add more games if needed and time allows! Players attempt to pass their soccer ball into the target ball and push the target ball over their opponent’s end line. Players will need to move to find another soccer ball after they complete a pass. Passes must be made from behind the cone lines. Players are allowed to run into the middle zone to collect any soccer balls that may be stuck there but must return to their cone line before passing. The game is won when one team successfully knocks the target ball across their opponent’s end line. Play at least three games! Reset soccer balls and target ball after each round. Weak Foot Only – Players must use their weak foot to pass. Multiple Balls – Play with three target balls! First team to get two target balls across their opponent’s end line, wins! Stress accuracy over power to the players. Passes must be made on the floor! Teach the players to use the inside of their foot to increase their accuracy. Plant foot should point to their target. Remind players that they want to quickly find another ball so that they can have the best chance at helping their team win.